On my way out of the office this afternoon I walked out the door just as a coworker from another department walked past. We said hello, she asked me a question, and I panicked. Panicked! Because it’s a long walk to the parking lot and the thought of small talk all the way after a day full of interpersonal interaction was just too much. Much too much. So I did what any slightly neurotic yet professional adult person would do… I ducked into the bathroom. I didn’t go, but I stood in there for a couple minutes, putting my hat and mittens on, and then left. I walked all the way to may car in sweet, sweet solitude. That was close! For a nerdy girl like me, school (of the elementary, middle, and high school variety and beyond) was tough for many reasons, but none were quite as painful to me as group work. It was always my least favorite thing– I hated having to depend on others, to not be in control, and most of all, interacting. Do you know how hard it is for someone like me to constantly try to say words to other people without being awkward? It’s hard! Real hard. Turns out, it’s not actually all that uncommon to feel that way. A revelation! 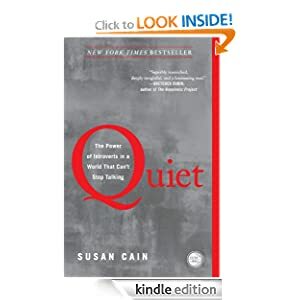 And that one piece of information made reading Susan Cain’s book “Quiet: The Power of Introverts in a World That Can’t Stop Talking” completely worth my while… but there was so much more! Cain begins by explaining how extroversion became the ideal in the US, describes the biology behind the personality type, and then discusses how to deal with introversion in the real world, in a culture where it’s not necessarily valued. As a science-minded individual, I really loved the explanation of the biology. Cain discusses really interesting research on “high reactive” individuals and explains that introversion can be predicted even in infancy by observing reactions to external stimuli. Introverts tend to react more strongly and than extroverts… translate that to adulthood and new people, new places, new situations leave an introvert in need of some major recharge time. I hate small talk– I’m terrible at it. But becoming overly familiar and engaged in deep conversation from the get go? That’s something I’m good at. Apparently, that’s an introvert thing. I enjoy social things once I’m there and fully engaged, but dang do I ever freak out in advance… and I really need to take time to wind down after the fact. Apparently, that’s an introvert thing too. And it’s all ok. The only part of the book I really didn’t like was the amount of detail related to parenting and teaching introverted children. It’s possible that it annoyed me only because I’m well past the point of it being helpful for my own life (watch me end up with devastatingly shy children now that I said that– karma), but I almost felt like it could have been a completely separate book– “Nerds: How to Parent or Teach a Child that Seems Really Weird.” Just think on it, Ms. Cain. We can discuss if you’d like. One of the things I found particularly interesting was the discussion of pseudo-extroversion and the ability of introverts to build community over the internet. No wonder I’m in love with Facebook (sorry, I know it’s not cool to admit that, but what a great way to keep up without direct interaction– dream come true!) and I’ve been surprisingly open to spilling my guts here… It turns out, a lot of introverted people interact better when they can do it virtually. So, Susan, friend, you say that introverts tend to be pretty good at the blessings in disguise thing? Finding the silver lining? Remembering that we can only see the underside of the tapestry from our vantage point? I’d say that’s an advantage to being an introvert– an introvantage, if you will. Cool.